Brees went 22-for-25 yesterday, but two of his three incompletions came from a dropped pass and a throwaway. From 25 pass attempts, Brees had just one true incompletion on the day. On throws 10-plus yards downfield, he was a perfect five-for-five for 109 yards and a touchdown, including two-for-two on throws 20+ yards downfield. Both Ingram and Kamara were fantastic in the win over the Bengals, but Ingram’s big plays get him the nod here. He rushed for 10 yards or more on three of his 13 carries and picked up four first downs on the day. On 16 total touches, he forced five missed tackles and racked up 162 yards. This was a statement game by a receiver who has all the talent to be one of the best in the NFL. Davis caught all seven catchable passes thrown his way for 125 yards and a touchdown. He has already matched last season’s totals with 43 receptions and two touchdowns, and he has eclipsed his yardage total with 576 so far this year. If the Titans want to keep pushing towards the playoffs, Davis will need to maintain this level of play. Delivering his best performance in a Bears uniform so far, Allen Robinson looked like the player we saw back in 2015. From eight targets, Robinson picked up 133 yards on six receptions. On the field for 31 passing snaps, that gave him an average of 4.29 yards per route run that ranks second in the NFL this week. 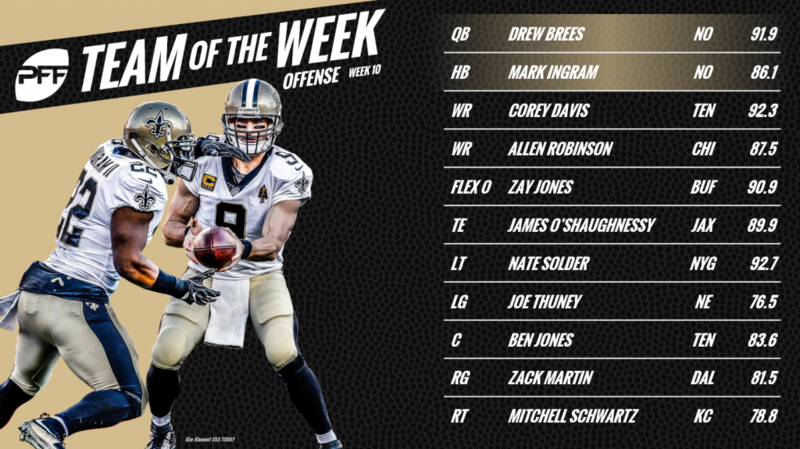 O’Shaughnessy caught all five passes thrown his way for 46 yards for was a solid performance in the passing game, but he lands on the PFF Team of the Week because of his well-rounded performance that included some impressive work as a run blocker. By the end of the game, he had delivered his highest PFF grade of the season, along with his highest receiving grade and run-blocking grade. Can you say Zay Jones breakout game? Jones caught eight passes for 93 yards and two scores in the win over the Jets, and the crazy thing is his performance would have been even better if not for a fumble on the edge of the end zone, which the Bills eventually recovered for a touchdown. Jones struggled with drops as a rookie, dropping five of 34 catchable passes, but so far in 2018, he has yet to drop any of the 37 catchable targets thrown his way. Solder didn’t allow a single sack, hit or hurry from 36 pass-blocking snaps, and produced a 93.5 PFF grade as a run blocker. Signed as a free agent this offseason, Solder has been solid, but this was by far his best game as a member of the New York Giants. Thuney delivered a standout performance in pass protection, with no sacks, hits or hurries allowed on the day. That 100.0 pass-blocking efficiency is particularly impressive when you consider that the Patriots dropped back to pass 47 times in the game. Jones joins Titans teammate Lewan on the PFF Team of the Week after another impressive performance. He wasn’t perfect in pass protection, as he allowed a hurry, but his work in the running game is what sees him earn the spot here. Martin did allow a hit in pass protection, but that was all he would allow from 32 pass-blocking snaps. Once again, he was also impressive as a run blocker, and it’s safe to say that he is starting the second half of the season off very well indeed. For the second straight week, Schwartz didn’t have a sack, hit or hurry in pass protection, this time coming on 38 pass-blocking snaps. That gave him a 100.0 pass blocking efficiency rating and his impressive run blocking helped land him on the PFF’s Team of the Week. Houston produced one of his best performances of the season in the win over the Cardinals, racking up two hits and three hurries from 26 pass-rushing snaps. It marked the second time this season where he has produced five or more total pressures in a single game, and he capped the performance with an interception. A frustrating night saw the Eagles lose the Cowboys, but Fletcher Cox was once again dominant on the defensive interior. From 35 pass-rushing snaps, he racked up a hit and four hurries, and he also added three defensive stops against the run. Clark is having a big year and it very much continued in the win over the Dolphins. He registered a sack and four hurries from 35 pass-rushing snaps and also added a defensive stop against the run. Coming off his lowest graded performance of the season against the Patriots last week, he rebounded with one of his best games to date. Many wondered if Lawrence could live up to his breakout campaign of 2017 and while he hasn’t quite been at the same level, he’s currently on course for the second-highest graded season of his career. In the win over the Eagles, he registered a hit and four hurries from 42 pass-rushing opportunities and added a pair of defensive stops against the run. Schobert is enjoying a career year in Cleveland and produced his highest graded game of the season so far in the win over the Falcons. A monster against the run, Schobert registered five tackles from 13 snaps in run defense, with four of those tackles resulting in a defensive stop. Brown was all over the field for the Chargers in their win over the Raiders, finishing the game with eight tackles. More importantly, he missed zero tackles throughout the game, and four of his tackles resulted in a defensive stop. On the field for 41 coverage snaps in the win over the Lions, Callahan was targeted six times. He allowed three receptions, but they went for just 16 yards combined. He also came away with a pass breakup and an interception and finished the game having allowed an NFL passer rating of just 16.7 on throws into his coverage. Stroman was targeted eight times in the Redskins win over the Buccaneers, and he allowed six receptions for 73 yards. Crucially though, he made a game-changing impact with turnovers, forcing a fumble and coming away with an interception. Williams has been up and down in his second season in the NFL, but he delivered his highest graded performance of the year in the big win over the Bengals. From 22 snaps in coverage, he was never the primary defender targeted in coverage on a play but still managed to come away with an interception. Gilchrist was targeted twice in coverage in the loss to the Chargers, giving up just one catch for four yards while he also came away with his first interception of the year. Gilchrist has struggled for much of the season, but this was by far his best performance. The Falcons went after Carrie, with 10 targets from 58 snaps in coverage, but it didn’t result in too much success for Atlanta. He allowed five catches, but they went for a combined 43 yards, and he also had a pass breakup. Boswell connected on his lone field goal attempt (which came from beyond 50 yards) and all seven of his extra point attempts in the Steelers’ big win over the Panthers. It’s rare that the Chiefs punter gets much attention, but Colquitt delivered a fine performance in the win over the Cardinals. Of his five punts, four landed inside the Arizona 20-yard line, with an average of 4.52 seconds of hang time per punt. 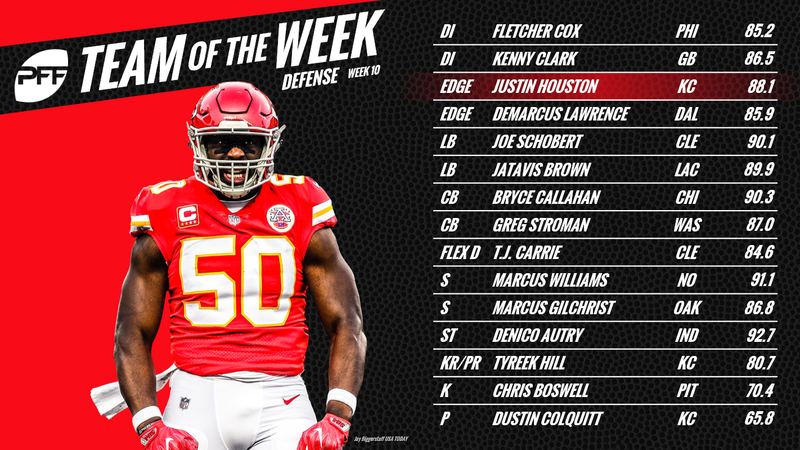 Tyreek Hill’s official stat line as a returner credits him with just two punt return yards, and yet here he is on the PFF Team of the Week. That’s because he would have had another spectacular punt return for a touchdown if it wasn’t for a nullifying penalty. Autry only saw seven snaps on special teams, and all but one of those came on the field goal block unit. He made a huge impact through, coming away with a blocked extra point.